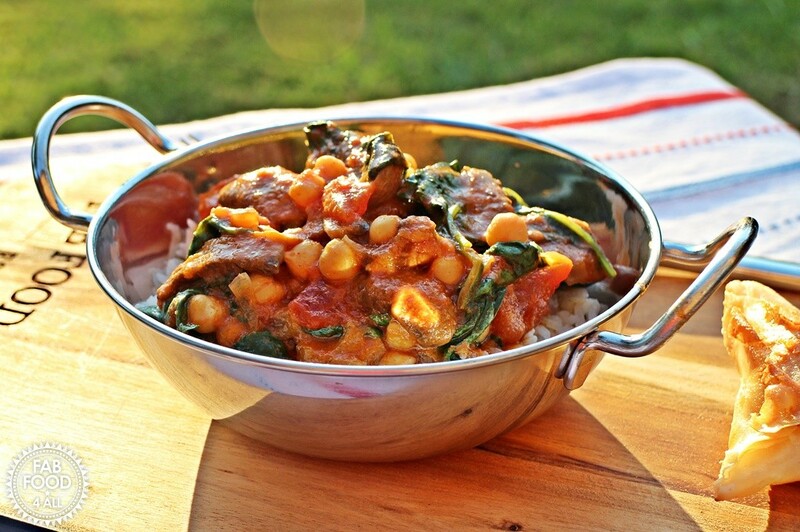 I love curry as does my family and it really doesn’t have to be a long drawn out affair when you just want a quick and nutritious meal on a week night. 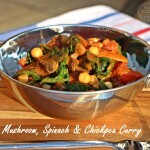 I came up with this Mushroom, Spinach & Chickpea Curry after one of my bargain shops. 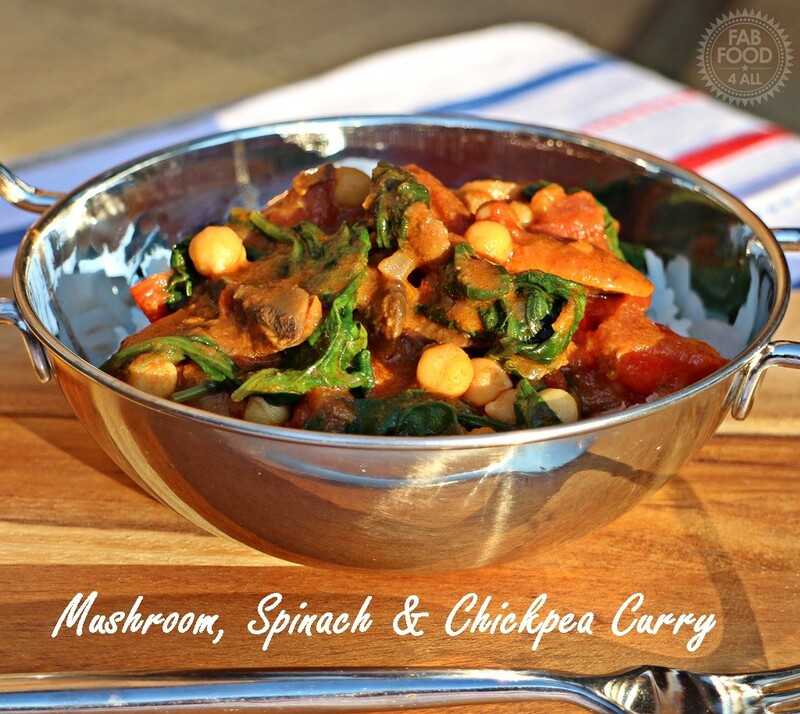 Having a carrier bag of mushrooms bought for 3p and a bag of spinach for 1p it just seemed obvious to make a Mushroom, Spinach and Chickpea Curry with added ingredients from my cupboard. I always have a box of Coconut Milk powder on the go as it is a far cheaper way of making coconut milk and lasts ages too (find it in the World Food Aisle if you haven’t discovered this marvel for yourself yet.) There’s also a pretty good selection of world food ingredients to be had from the freezer in your local supermarket and that’s where I recently picked up the frozen garlic and ginger blocks (also reduced) which make life so much easier! My family loved this vegetarian curry which we had with some vegetable samosas, rice and mango chutney. Why not enjoy if for a #MeatFreeMonday? 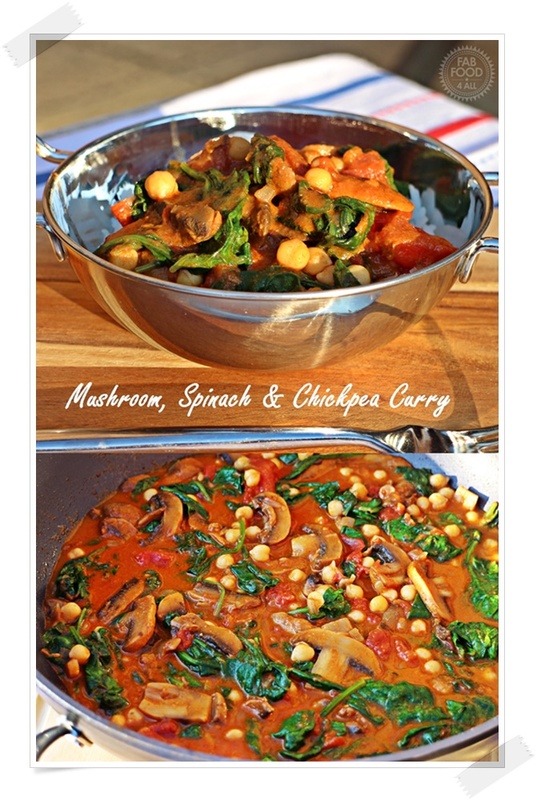 We seem to be having a lot more vegetarian dishes these days and no-one says “where’s the meat?” any more! As this dish was so thrifty I am entering it into Credit Crunch Munch which I am hosting this month and run with Fuss Free Flavours. Then I’m entering it into the No Waste Food Challenge over at Elizabeth’s Kitchen Diary, Extra Veg over at Utterly Scrummy which is co-hosted by Fuss Free Flavours and finally into Meat Free Mondays over at Tinned Tomatoes! Heat the oil in a pan, add the onions and ginger/garlic and fry on a low to medium heat until the onions are golden, stirring occassionally (about 10 minutes). Add the curry powder and fry for a minute. Then add the mushrooms and fry until cooked through and any liquid evaporated. Add the chopped tomatoes, coconut milk and salt, bring to the boil and then reduce to a simmer for 15 minutes under a lid. 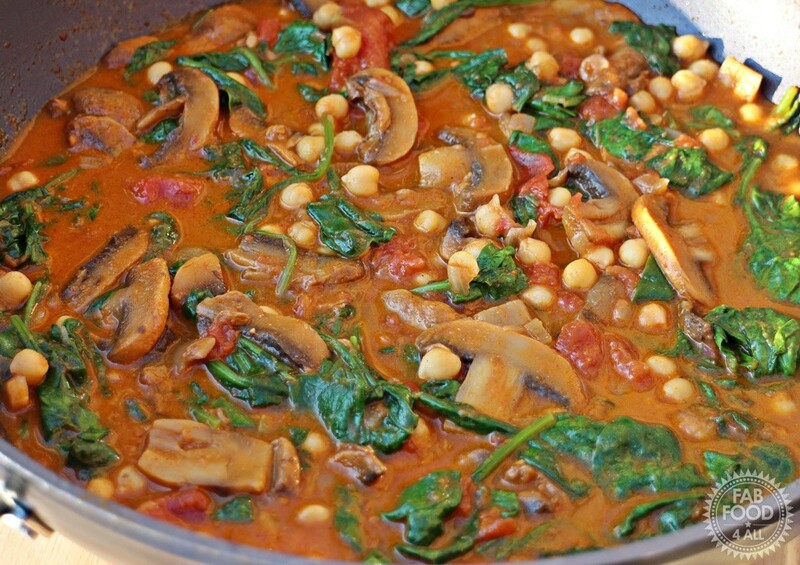 Add the chickpeas and baby spinach and heat through for a few minutes until the leaves have wilted. Serve with rice, vegetable samosa and mango chutney. Enjoy! Had this tonight and it was super tasty, however have a bit left over and wondered if it could be frozen? Hi Christine I have never frozen it so couldn’t say how it freezes, I would just reheat it and have the rest for lunch or dinner the following day. This looks so good. A nice change from my usual Sweet Potato based recipe.